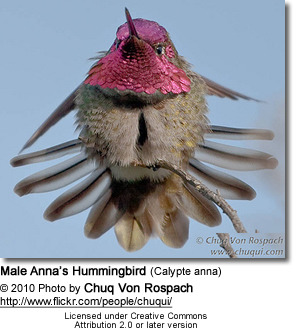 The Anna's Hummingbird (Calypte anna) was named after Anna Masséna, Duchess of Rivoli - the wife of a nineteenth-century bird collector, Duke Victor Massena. 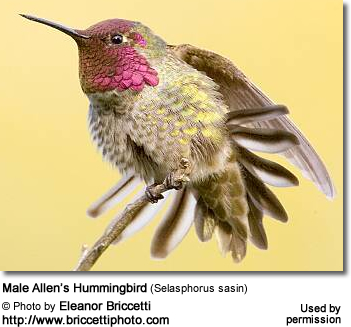 It is one of only three species that are permanent residents of the US or Canada; the others being the Allen's and the closely related Costa's Hummingbirds. These hardy creatures are the only hummingbirds to winter in northern climates, provided there are plenty of winter flowers to support them. 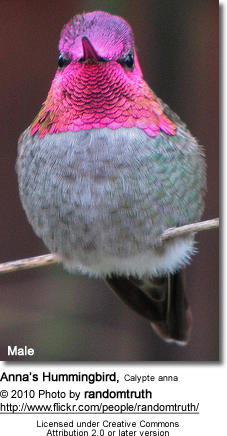 It is the only North American hummingbird species with a red crown (top of the head). 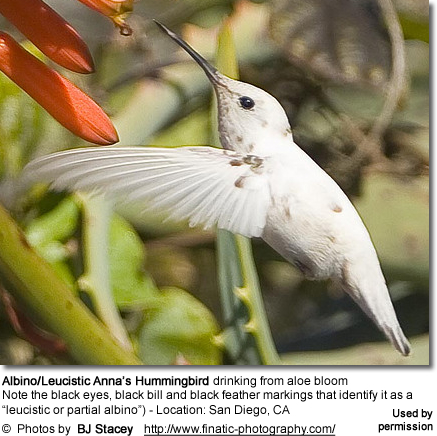 It is the largest and most common hummingbird found in California; and the only one that produces a song. These tiny birds are common within their range; and it is estimated that there are about 1.5 million of them in existence. In fact, their numbers appear to have increased as they have adapted well to urban development and have expanded their range in recent decades in and around towns and cities, particularly where gardens with garden feeders and ornamental flowers provide a suitable nesting and feeding habitat for them. They are well known for their territorial behavior; the male makes elaborate dive displays at other birds and sometimes even at people. Specifically, they have been recorded in the following U.S. states: Alabama, Alaska, Arizona, Arkansas, California, Colorado, Florida, Georgia, Idaho, Kansas, Louisiana, Mississippi, Missouri, Montana, Nevada, New Mexico, North Carolina, Oregon, Tennessee, Texas, Utah and Washington. One single male was documented in Rapid City, South Dakota in October 2008. They typically remain in lower-level areas, but may move up to higher elevation mountain meadows with suitable flowering plants. They inhabit chaparral, open woodlands, fields, gardens and parks. They primarily feed on nectar taken from various brightly colored, scented small flowers of trees, herbs, shrubs and epiphytes. They particularly like the Red or Fuchsia Flowered Gooseberry (Ribes speciosum), Eucalyptus, Red-Hot-Poker (Tritoma), Lantana, the Hummingbird sage (Salvia spathacea), California fuchsia (Zauschneria californica), and the Desert Willow (Chilopsis linearis). They use their long, extendible, straw-like tongues to retrieve the nectar while hovering with their tails cocked upward as they are licking at the nectar up to 13 times per second. Sometimes they may be seen hanging on the flower while feeding. 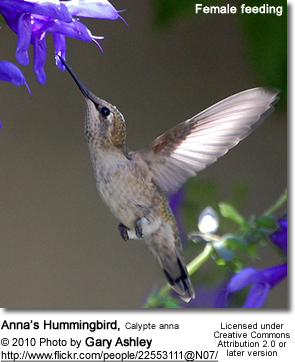 Many native plants on whose flowers they feed heavily rely on hummingbirds for pollination. As these small birds thrust their long bills deep into the flowers for nectar their faces are dusted in pollen, which they then carry to the stigma of a nearby similar plant. They also take some small spiders and insects - important sources of protein particularly needed during the breeding season to ensure the proper development of their young. 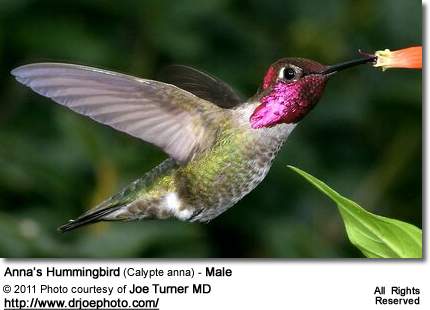 In fact, the Anna's Hummingbirds consume more insects than any other North American hummingbird. Insects are often caught in flight (hawking); snatched off leaves or branches, or are taken from spider webs. A nesting female can capture up to 2,000 insects a day. 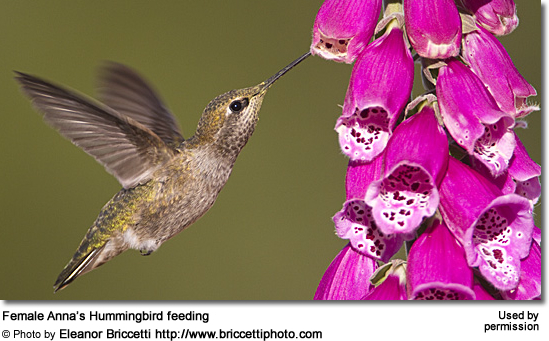 Males establish feeding territories, where they aggressively chase away other male hummingbirds as well as large insects - such as bumblebees and hawk moths - that want to feed in their territory. They use aerial flights and intimidating displays to defend their territories. A PBS documentary aired first January 10, 2010 showed how Anna's aim for flying insects, then open their beaks very wide to catch them. That technique has shown more successful than trying to aim the end of a long beak at the insect. 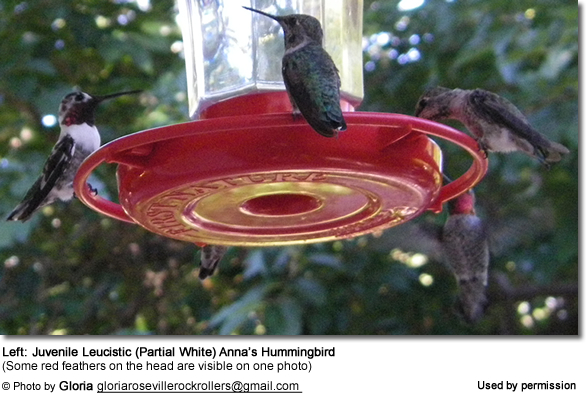 The Anna's is one of the most vocal hummingbirds. Both males and females emit a simple toneless "chip" as they move from flower to flower, and the males produce a buzzy song during the breeding season. 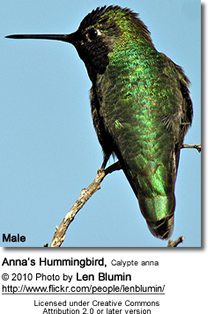 These vocalizations clearly distinguish them from the other, mostly silent, hummingbirds. The male's song is a complex series of scratchy noises, sounding like a sharp "chee-chee-chee", which may be repeated for several minutes. When mating or defending his territory, the male produces a high-pitched loud popping sound at the bottom of his dive, which is now thought to be made by its tail feathers (instead of its mouth).